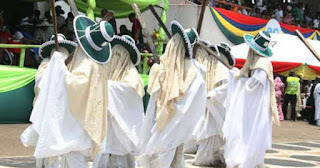 The Lagos State Police Command and the traditional ruler in Ikorodu, on Monday evening, allayed fears of residents following apprehension making rounds on social media that females around Ikorodu area should stay indoors and refrain from moving around town, on Tuesday, May 8, for the Oro Day festival. In a statement jointly signed by the State Commissioner of Police, Imohimi Edgal, and the Ayangburen of Ikorodu, Oba Kabiru Shotobi, shortly after a meeting, the Command assured the womenfolk of their safety and right of freedom of movement blaming the report that went viral on mischief makers. The joint statement came following the circulation on social media of a letter purportedly written by Mr. Shotobi to the organizers of the Oro festival stating that women are forbidden from moving around the town during the festival. “This is to notify you of the above-mentioned festival which is slated for Tuesday 8th May 2018, according to tradition all female are forbidden to be seen outside their homes or move around the town on this date which is Oro Day,” the letter stated. “The attention of the Lagos State Police Command has been drawn to the news making the rounds on the social media that the female gender is forbidden to be seen outside their homes or move around the town with effect from tomorrow 8/05/2018 being the day set aside as ORO DAY. “In view of the above, the CP Lagos called for a meeting attended by the Ayangburen of Ikorodu, Oba Kabiru Shotobi, Palace Chiefs and the Commissioner for Local Government and Community Affairs, Alhaji Muslim Folami. “The Oba stated during the meeting that it is unthinkable for a man with his level of exposure to do or say anything that would be seen as discriminatory against the female gender. “He, however, acknowledged that the festival is an age-long tradition of Ikorodu people which had been even before he was born. He added that the festival would hold without denying the female folks their right of freedom of movement,” the statement said. The statement also quoted the Commissioner of Police as saying that the Command would not tolerate any discriminatory tradition against the female gender, warning that the Command would deal ruthlessly with anybody who hides under the guise of custom or tradition to foment trouble in the state. Imohimi, therefore, enjoined women to go about their lawful business without let or hindrance.